The ST Flex Green ... offers impressive thermal insulation. Dormakaba offers a complete automatic sliding door system that will support energy-efficient buildings. 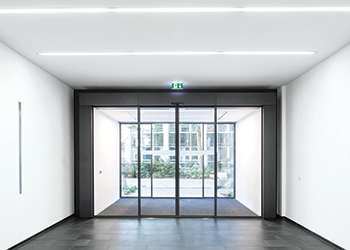 With its automatic sliding door ST Flex Green, the German company has further underlined its contribution to increasing energy efficiency and thus to improving the sustainability of buildings. The door system excels through its slender, thermally insulated frames based on the Flex profile system. Despite its slender design, the ST Flex Green offers impressive thermal insulation as confirmed by the German testing, surveillance and certification body ift Rosenheim. “ST Flex Green profiles act as a barrier between the outside and inside temperatures and this contributes to energy savings. These sleek slender energy-efficient thermal break profiles have thermal coefficient material fixed inside the profiles,” says a spokesman for the company. He says ST Flex Green considerably reduces energy and air-conditioning expenses and cuts carbon dioxide (C02) emissions. And despite their thermal insulative properties, the profiles look like standard ST Flex systems, harmonising with the façade’s overall design. He says sustainability for dormakaba means acting responsibly on an economic, ecological and social level. “Sustainability has also become the UAE’s major focus with Dubai aiming to be one of the most sustainable cities in the world. Other countries in the GCC are also following the path to sustainability with green building councils such as Qatar GBC and Saudi GBC,” he adds. ST Flex Green is suitable for customers looking for a highly-effective draft control and energy-saving system. Combining form with function, its features harmonise with the building’s overall looks while offering an outstanding thermal insulation Ud value of 1.4 complying with German-energy saving regulation EnEV2009. “Even the smallest ST Flex Green door system meets the requirements of Germany’s EnEV 2009, which stipulates a certain Ud value for complete door systems. It is worth remembering that as doorsets increase in size, their Ud value decreases exponentially,” explains the spokesman. ST Flex Green fits perfectly with the existing Dorma sliding door range, and despite its slender profile system with thermal insulation, is extremely solid. It is also backed by an Environmental Product Declaration (EPD), which further gives transparency to the product’s whole lifecycle and environmental impact. To meet various requirements, the ST Flex Green is fitted with the ES 200 system that provides three different operator versions (ES 200 Easy, ES 200 and ES 200-2D). Doors with ES 200 Easy are suitable for door weights of 2 by 100 kg while the ES 200 can handle doors of 2 by 160 kg. The established Dual Drive technology (ES 200-2D) escape route version is designed for door panel weights of 2 by 130 kg making these sliding doors highly suitable for emergency exits and escape routes. In addition, passage widths of up to 3,000 mm may easily be realised. ST Flex Green has a service life of 10 years, with a total of one million closing cycles. The panels and side screens are manufactured at ISO 9001-certified locations, thus ensuring their high quality. “We have a lot of projects where we have specified ST Flex Green as it is an important requirement for weather conditions in the region. The response from the architectural community has been very positive and we see this product becoming a trend in the industry,” the spokesman concludes.